Scientists find that parasites dramatically alter how much methane a sheep emits. It’s estimated that 40% of greenhouse gas emissions come from agriculture, and a substantial portion of that is directly ’emitted’ by livestock. And just last year, climate scientists reported that we’ve actually been underestimating the extent to which the combined belches and flatulence of farmed animals contributes to climate change by 11%. Unsurprisingly, there’s been renewed interest in reducing those emissions, especially considering the demand for livestock is only growing. Now, scientist from the UK report one thing that will help: keep the animals parasite-free. Livestock’s sizeable contribution to climate change has farmers and scientists working together to find ways to reduce their gas emissions. There are efforts looking into things like revamping feeds or optimizing gut microbes, but so far, there simply aren’t any reliable and affordable ways for farmers to reduce their flock’s flatulence—other than reducing those flocks, period, that is. And with the world’s hunger for meat and milk continuing to grow with an ever-growing human population, that’s not really a solution. But it turns out that few have looked at how the health of an animal affects the gasses it emits, even though health issues are a constant battle for farmers—and one that’s only going to get worse, as livestock parasites are currently predicted to increase in prevalence as the planet warms. So the researchers took 72 twelve to fifteen-week-old lambs, and infected some of them with a common intestinal worm (Teladorsagia circumcincta). Because the parasite tends to reduce appetite, they created two non parasitized control groups—one allowed to eat whatever they wanted, and one with a restricted diet (80% of the regular amount). And a month and a half later, they put each of these groups of lambs into a special chamber for three days that recorded the concentration of methane in the air. As expected, the sick lambs seemed a little, well, sick—they gained only 7 g/day while the free-fed controls put on 174 g/day. And they ate less than the free-fed controls, which was exactly as expected. Because they consumed less food, they also produced less methane overall. But when methane production was standardized to food intake, the sick lambs were found to be producing more of the potent greenhouse gas per amount of feed—33% more, in fact. “This is to our knowledge the first study to demonstrate that infectious disease can increase methane yield,” the authors state. 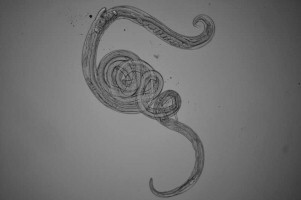 It’s not clear exactly why the intestinal worms caused such a dramatic increase in emissions. Parasites can influence gut microbiota as well as their hosts, but the nature of the study prevented any clear answers as to what about the infected lambs was causing an increase in methane production. “Whilst our results identify a novel phenomenon, they do not reveal the mechanism,” the authors lament in their conclusions. But whatever the reason, the findings suggest controlling livestock parasites could be a potential climate change mitigation strategy, as healthier animals produce fewer greenhouse gasses. And while many of these parasites are becoming increasingly resistant to veterinary drugs, there are non-medicinal parasite control strategies that are cost-effective. “As the increase in ovine meat production is expected to be highest in developing countries, with restricted access to improved feeds, feed supplements and efficiency gains through genetic selection, parasite control offers a viable and accessible way of reducing emissions,” the authors write. And the animals probably won’t mind the extra attention to their health, either. After all, these gut parasites tend to be accompanied by things like diarrhea and nausea—which are no more fun for livestock than they are for us. “Livestock Infected with Worms Belch and Fart 33% More Methane” Euthanize all North Koreans: Send no foodstuffs, no charity. Let God and Socialism proceed unimpeded. … just last year, climate scientists reported that we’ve actually been underestimating the extent to which the combined belches and flatulence of farmed animals contributes to climate change by 11%. More to the point, how much is methane going tun up global temperatures? We never see that number. Probably because it isn’t very much, closer to zero than anything else.